Usually when a person buys a product, he or she does so with little or no planning. In my business, prospects may have toyed with the idea of shopping around at a few dealerships, but rarely had they actually intended to buy a car on the day they moseyed into the showroom. Top salespeople understand that many people buy impulsively—and if you can’t close these sales, your sales career is going to be rough sledding. You can’t limit your sales production to only those individuals who know exactly what they want and who have the determination to buy. Unfortunately, these customers are not the norm. Keeping this in mind, it’s natural that many customers will be consumed with doubts after they have spent their hard-earned cash. You must be aware of your customer’s mind-set and potential remorse. You must never forget: A canceled order is not a sale! As you well know, a lot of time and effort goes into setting up appointments and making sales presentations. With this in mind, it’s a pity to lose a sale after you’ve won it. But people do cool off—if you let them cool off. When you lose a customer due to buyer’s remorse, not only is it money out of your pocket, but even worse, it whittles away at your positive mental attitude. A canceled sale hurts considerably more than no sale! 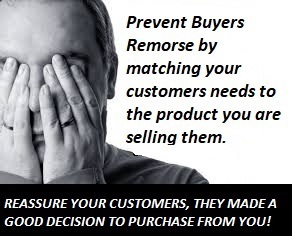 Even satisfied customer’s can develop severe cases of buyer’s remorse if you fail to perform as promised. You just established a new customer, and possibly a new friend, so stick around for a few minutes and reassure him that he means more to you than just a commission check. Let him know that you care about him as a human being. It doesn’t matter what you sell, you should also make a special effort to keep in touch with your new customers to reassure them that you were sincere when you promised to provide outstanding service. Excellence in servicing customers has everything to do with sales—future sales. Always, I repeat, always tell your customers that he or she made a wonderful decision to buy. People need this reinforcement, so give it to them. Congratulate them on their excellent buying decision and let them know that you look forward to serving them for many years to come.